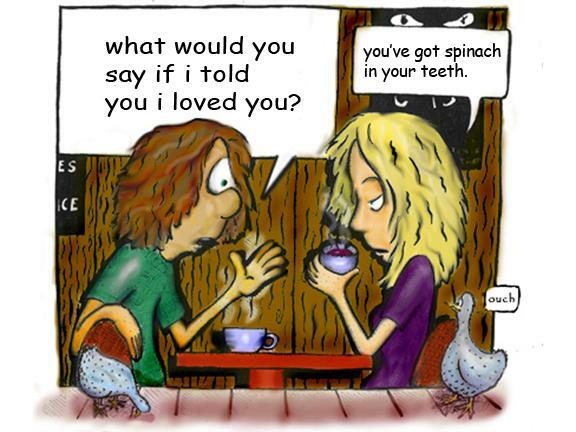 People all the time (mainly men, for some strange reason) find spinach in their teeth and seem to have a weird habit of checking their teeth for this charming delicacy. I say either coat it with barium, or to just grow it on radioactive land so as that it will glow or show up when you're going to that important date as to whether there is any traces of it in your mouth. I find it quite attractive. I understand now why Popeye, in spite the fact that he ate spinach, loved someone named Olive. Then people want to hand you their credit card after they've picked a few with it. Its probably worth growing radioactive radishes, too, also. The red and the green would complement each other. Now all youd need is a blue vegetable, also capable of emitting light radiation.